First Published in 1989, this work is based around a monthly TV column which Raymond Williams wrote for The Listener between 1968 and 1972. Those were the years of the Prague Spring, of anti-Vietnam war demonstrations, of fighting in Cambodia and Northern Ireland, of hope for McGovern in the United States and attacks on the Wilson Labour Government in Britain. In The Listener articles Williams comments on all of these events, providing a rare glimpse not only into the events of his daily life but also into the continuing development of a personal sociology of culture. The articles also discuss such television forms as detective series, science programmes and sports, travelogue, education, gardening, and children’s programming. The book also includes Williams’ key lecture "Drama in a Dramatised Society", which sets a framework for his analysis; a London Review of Books piece on the Falklands/Malvinas adventure as a "tele-war"; and an interview with Williams on television and teaching. 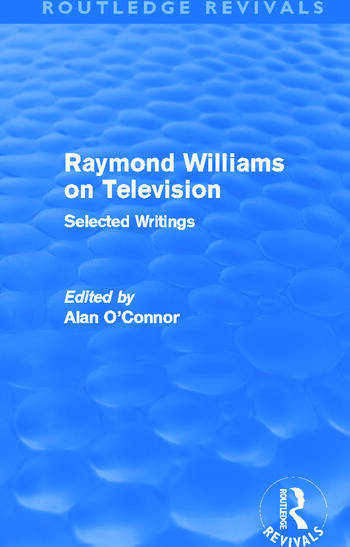 Cited by The Guardian as "The foremost political thinker of his generation", Williams’ writing amounts to a primer on ways of watching television and of critiquing its profound social and political impact.